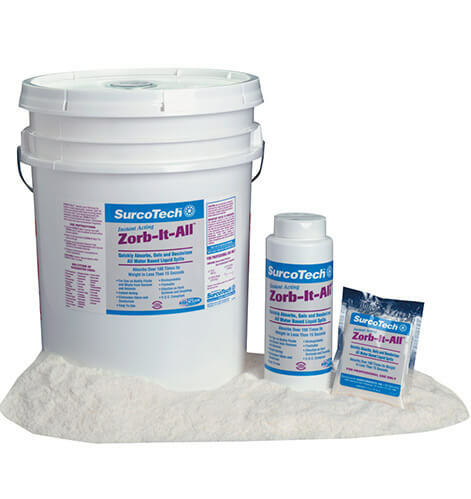 Zorb-It-All™ is the preferred choice for any emergency because it absorbs over 100 times its weight of water base spills while simultaneously controlling odors. Upon application, it instantly “gels” all water-borne human and animal bodily fluids including blood, urine and vomit. It works on hard surfaces and carpet, and deodorizes with a fresh mint odor counteractant fragrance. Trash compactors, waste haulers, hospitals, nursing homes, incontinence accidents (excrement), vomitus (emesis) removal, body fluids, industrial plants, processing plants, athletic clubs, day care centers, shopping centers, laboratories, restaurants, taverns, food spills, schools, jail cells, portable toilets, plumbing contractors, pipe leaks, apartment complexes, airlines, cruise liners, water crafts, ambulance service, public transportation, school buses, taxi cabs, pet stores, zoo facilities, veterinarians, kennels and more. Sprinkle Zorb-It-All® evenly onto any spill. (NOTE: Zorb-It-All® will not adhere to floors when properly applied. Sweep up and properly dispose of gel. Zorb-It-All® is biodegradable and may be flushed for immediate disposal. Dispose of biohazards in accordance to current regulations. CAUTION: Surfaces may be slippery after Zorb-It-All® is used. Contains: Dry Absorbent Earthen Granular Media & Odor Counteractant Fragrance. Not classified as hazardous under all GHS Classifications.